Massimo's, one of my favourite 2am pit stops for a slice of pizza, was temporarily shut down last week. On the front door, management has posted a notice (above) citing problems with the ventilation/exhaust system which they're taking steps to resolve. But on further analysis, it appears the restaurant was closed for far more infractions than management was willing to admit. 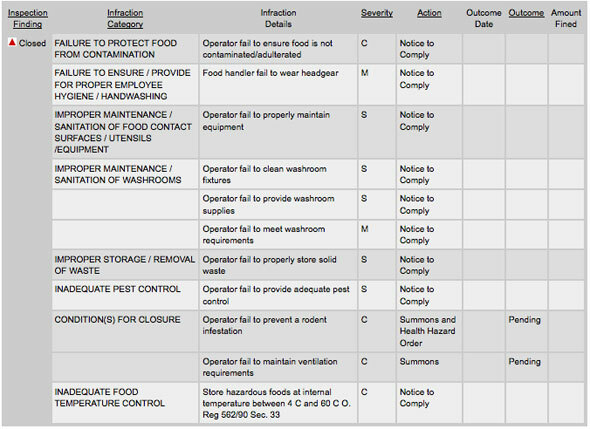 A rudimentary search on DineSafe reveals that Massimo's was hit with 11 infractions by city inspectors including failure to prevent a rodent infestation, failure to store solid waste and failure to provide clean washroom fixtures. Gross. Say it ain't so Massimo's? Don't make me go to Amato's!